I bought a used mountain bike. I went for a ride. It only looks like it took a month because I had it on pause for a couple of weeks while working on another project. Originally started as a gift for an aunt, but these are the Wrong Colors. Instead, gave to EAN. Comments Off on Oh, Helen! The top of the collar goes really fast, and then of course the ruffles/increases slow it down. 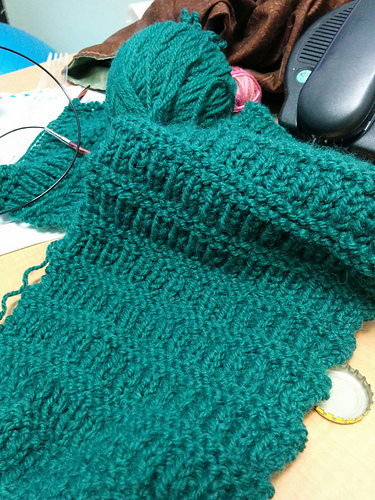 Still, a fast knit that ended up with a cute piece. Would still like to at least wash if not fully block, also I need to find the right ribbon. A few thoughts about musicals and history nerdery. 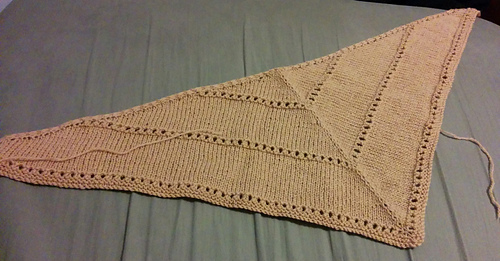 Surprisingly quick for a shawl-type project, and easy enough to follow to be able to knit in meetings. Absolutely positively needs some blocking (see comparison between the two photos! ); I soaked then dried on a towel with just a bit of shaping. After that it lies quiet nicely. I don’t know if I’m going to keep it though, which is mostly about the yarn: somewhat on the scratchy side, and not the most flattering color for me personally. Don’t know if I’m going to keep these, as they aren’t really my style. May end up gifting, or even hold onto to sell someday? Also: still need buttons & weaving in ends, but should really consider completed. Made with some mystery yarn that I found in a free box across the street from Ralph’s. (I think it’s wool or a wool blend.) Something for inbetween projects to keep my hands busy.